Tay Garnett was a hard-nosed, job-of-all-work director who moved from studio to studio and genre to genre throughout the golden age of Hollywood. He never achieved the status, let alone the distinctive signature, of a Howard Hawks or Raoul Walsh; still, with talent, brashness, and cojones to spare, he was responsible for a slew of cheerfully vulgar entertainments, and several genuinely fine films. Bataan may well be the best. Certainly it’s one of the strongest Hollywood salutes to the war effort while World War II was still raging. 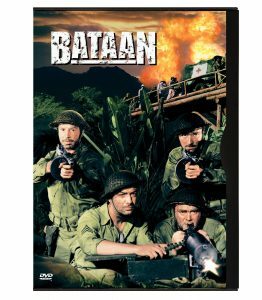 In his grittiest role to date, Robert Taylor (sans mustache) plays a U.S. Army sergeant fighting a rear-guard action in the Philippine jungle, covering Douglas MacArthur’s retreat. His platoon is the usual wartime study in democratic motley: veterans (Lloyd Nolan, Thomas Mitchell, Tom Dugan) thrown together with green recruits (Robert Walker, Barry Nelson), a Latino (Desi Arnaz), a black (Kenneth Spencer), not to mention a couple of stalwart Filipinos (Roque Espiritu, J. Alex Havier), and several officer types (George Murphy, Lee Bowman) with sense enough to defer to the sergeant’s judgment. As in John Ford’s desert classic The Lost Patrol, the group is whittled down through misadventure, disease, and skirmishes with the ever-advancing Japanese, till only a handful remain for a still-shattering last stand. This film’s dedication states that it is dedicated to the heroes of Bataan. Desi Arnaz has said it was his idea to recite the Latin prayer — Mea Culpa —  during his character’s death scene. It was a prayer he learned as a boy in Cuba. Metro-Goldwyn-Mayer paid RKO $6,500 for the right to use scenes from The Lost Patrol in this movie. In his autobiography, M-G-M executive producer Dore Schary refers to this film as a remake of that one. The NAACP gave M-G-M two awards for presenting an African American in an intelligent and sympathetic manner. Dore Schary deliberately did not tell writer Robert Hardy Andrews he was planning to cast an African American as one of the soldiers, in order to avoid any racial speeches in the script. This is one of few contemporary World War II films to feature an American soldier who was an African-American. As such, the movie was not shown in parts of the American South. The book — The Films of World War II —  notes that producer Dore Schary said that letters of complaint were received by the studio.